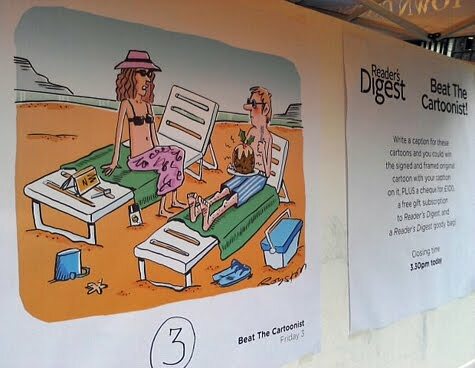 Reader's Digest had a presence at the Shrewsbury Cartoon Festival for the first time this year, with a stall and a talk on cartooning. You can read an article about it by Alex Hughes over at the Bloghorn. 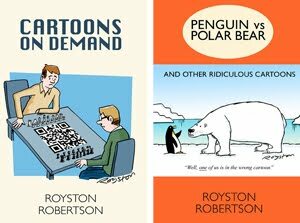 They ran a version of their Beat the Cartoonist competition, and a cartoon of mine, above, was one of those used. The contest wasn't quite the same as the magazine version as the Digest team just picked their favourite entry for each cartoon. The original caption was not revealed, probably because the gags have yet to appear in the mag. So I'm not going to reveal it here either, but feel free to make suggestions in the comments below! You can read the Shrewsbury winner in the Bloghorn article.